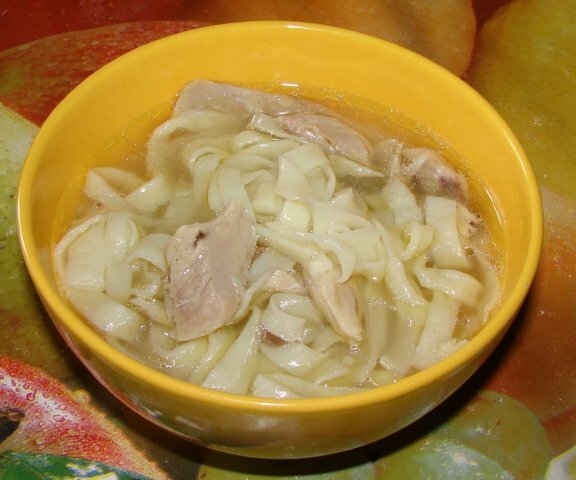 Chicken noodles - a delicious, hearty and healthy dish. Besides cooking it does not take much time. 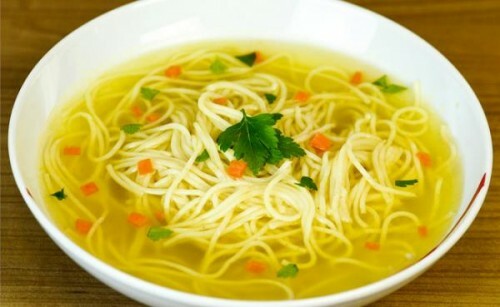 Because of the low calorie chicken noodles can be attributed to the meals diet. Preparation lapshev capacity break three eggs. Add a pinch of salt. Gradually stir in the flour. Knead the dough so that it turned out quite cool. On the table roll a very thin cake thickness of about 3mm. with a Sharp knife cut the dough into equal width strips. It is desirable to make them as thin as possible. In the process of cooking noodles increases in size. Leave for a while to make the strips a little dry. In this case, they will not be confused and to adhere to each other. Will bolevshie chicken fresh or pre-thawed. Rinse thoroughly under running water. Put on the stove a pot of salted water. When it boils, put the chicken in it. Add aromatic roots. Finely chop the onions, carrots and bell pepper. Its color may be any. Preheat the pan with oil or butter. Saute her vegetables until Golden brown. Put the finished mixture into the pan. Broth produces a pleasant shade. Add a few peas black pepper and Bay leaf. Peel the potatoes, wash, cut into small wedges. Place in a bowl with cold water below it is not dark. When the chicken is fully cooked, remove it to a plate. Wait until it cools down and have it into portion pieces. When the chicken is done is defined with a fork. Place pre-cut potatoes into the boiling broth. When it is cooked until soft, add pre-cooked noodles. Give a little boil. Try the broth to taste. If needed add more salt. When noodles is cooked, turn off the stove. Finely chop the parsley, dill and green onions. In a bowl pour the finished noodles, put chicken. Sprinkle on top of greens. Frequently skim the foam from the broth. Otherwise it will become cloudy. Before you put the noodles in the pan, put it in a bowl of cold water. The extra flour will wash off, and the broth will remain transparent. Passerovannye - easy roasting vegetables in oil, with the exception of the appearance of the cover. When you want to eat, but to cook the dish out numerous recipes in a hurry. For a tasty lunch, for example, you can prepare a simple chicken broth and add just a few additional ingredients. It turns out very tasty, and most importantly – quickly. For this soup, all the components are at hand in every kitchen. Chicken thighs rinse well. Place them in a small pot and cover with water (1.5-2 liters). Simmer meat until tender for about an hour. Don't forget to remove the foam. Boiled chicken put in a separate bowl, sieve the broth until it becomes transparent. Carrots slice small strips and onions finely chop. Send the vegetables in salted boiling broth and cook them for 10 minutes. Add the egg noodles, Bay leaf and pepper. Cook the soup until cooked noodles (usually about 5-10 minutes). Chicken meat separate from the bones, cut into medium-sized pieces and place into the broth. When the soup is ready, add the finely chopped greens and serve. If the noodle is too long, it can be broken for convenience before cooking.